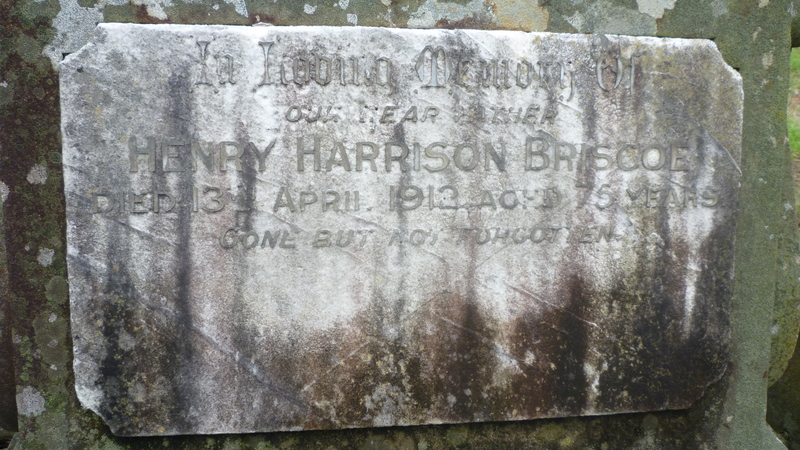 On this day, April 13, in 1912 my great grandfather Henry Harrison Briscoe died at his home in East Hills NSW. He now lies in an unassuming grave near his wife Elizabeth in St. Saviour’s Church of England Cemetery, Canterbury Road Punchbowl. However, the simplicity of his burial place belies his birth, the full life he lived and the journey that led him there. Henry was born in 1837 in county Waterford Ireland into a well-to-do family of Henry Harrison Briscoe (snr) and Elizabeth Thomasina (nee Walsh). He was christened on 27 August that year in Clonmore, County Kilkenny near the family estate at Cloncunny. Henry Snr was a magistrate in Kilkenny and then an inspector of poor law in County Clare during the later years and aftermath of the Great Famine. He was later appointed as the Inspector General of Poor Law in northern Scotland. Young Henry was one of six children and the fourth and youngest son. At that time in Ireland younger sons of the gentry would generally not inherit property but rather be provided with careers such as the church, diplomatic corps or the military, and the latter seems to have been decided as young Henry’s destiny. Henry then appears in the 1851 census when as a 13 year old he was attending a Preparatory Military School at Eltham in Kent. His fellow students included boys from throughout England, several from Ireland and British India plus one from Australia. These latter classmates might, at least in part, explain his future travels. In November 1855 it was announced in the Irish press that an Ensign commission was purchased for him in the 81st Regiment of Foot (Loyal Lincoln Volunteers). During this period the purchasing of commissions was common for junior officers such as ensigns or second lieutenants. The army from time to time issued lists of the maximum prices for purchases of commissions and the 1837 edition of the King’s Regulations the price for an Ensign was ₤450 (being approximately equivalent to ₤30,000 today) and this is likely the sort of price Henry’s family had to pay for his commission. The 81st had been stationed in Kilkenny at various times but was in India when Henry joined the regiment. Henry followed shortly after among “a draft arrived in Calcutta” of 1 Lieut., 2 Ensigns and 53 privates on 10 December 1855. Shortly after, in July 1856, Henry was promoted to Lieutenant with the purchase of that commission, probably for an additional ₤250. When the Indian Mutiny (otherwise India’s First War of Independence) broke out in May 1857, the 81st Regiment was instrumental in disarming the rebels in and around Lahore in present day Pakistan, in maintaining order and preventing the spread of the mutiny in the Punjab. In 1858, “Captain Chichester, Lieuts. Musgrave, Faircloth, Speedy, Briscoe and Jackson and Qr Master Correll, served in the Eusoofxie expedition” to punish the inhabitants for harbouring mutineers. For his service Henry received the Indian Mutiny Medal in 1859. On his return from the frontier he married the twenty year old Annie Alice Roberts in Bombay. From her death certificate we learn that Annie had been born in Hydrabad the daughter of Edward Howard Roberts and Mary (nee Rodney). Henry retired from the 81st Regiment in March 1861 when he sold his Lieutenant’s commission. Family stories suggest that for the next few years he worked in a bank or with the East India Company but no evidence of this has been discovered. In early 1865 Annie developed a lung disease and the young Briscoes migrated to Australia arriving in Melbourne in about April of that year. They lived at 2 Nicholson Street, Fitzroy, where Annie’s condition deteriorated and she died on 1 January 1866. The following day she was buried in Melbourne General Cemetery. Annie’s death certificate also indicates that she had a child, another Henry Harrison, who had died but no other record of this child has been found. It appears that Henry “went bush” soon after Annie’s death as his next appearance is in the 1869-70 electoral rolls for Balranald in NSW. He was recorded as residing in the Darling Back Country at Langawirra [station] some 130 kilometres northwest of Broken Hill. Later from the 1878-79 electoral roll we see he had a leasehold property at nearby Kayrunera [station] in the ‘Darling Back Blocks’. 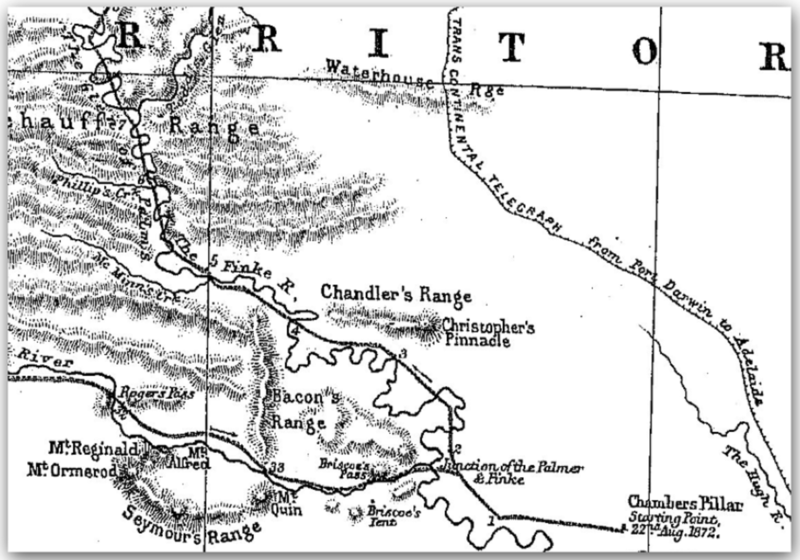 This was the time when there were great stock runs north of Wilcannia on both sides of the Darling River. Intervening spaces were occupied by itinerant small nomad squatters moving their small flocks from place to place, paying periodic rentals, shearing at the woolsheds of friendly owners and moving their residences from time to time to new country on leased crown blocks. Among these were Abraham Wallace and his sons, H.H. Briscoe and W. Ifould. Henry made his living in this manner, registering a brand for his horses as HHB (conjoined letters with letters) in 1879 at Wilcannia, but he also acquired 225 (one pound) shares in the Great Wilcannia Amalgamated Copper Mining Company (Ltd) operating near Wilcannia. Friday, 15th November  — I rested the horses at this place to-day and did not move the camp. I walked to the top of the tent-hill, and from there saw, that the creek went through another pass a little to the N.E. of our camp. In the afternoon I rode over to this pass, and found some ponds of water a little to the west of it; a bullock, whose tracks I had seen on the creek, had got bogged here, and was now left high and dry. I called these ponds and pass “Briscoe’s-Pass” and ” Briscoe’s-Ponds,” and the little tent hill I have named “Briscoe’s-Tent,” after Mr. H. H. Briscoe, of the Darling-River, who was living with my two friends, Messrs. Middleton and Rogers, when I last saw him. It can be concluded that Henry Harrison Briscoe was a long standing and well respected resident of the Darling Back Country. Although he may not have travelled further west to the interior of the continent, his name surely did. On 1 February 1883 Henry finally remarried as a 45 year old widower to the 24 year old Elizabeth Warren, daughter of Richard Robins Warren and Ann Livingston(e) at the Registry Office in Hoddle Street, Collingwood, Victoria. Elizabeth was the eldest of the 13 Warren children and was born on 5 January 1859 at Huntly, Victoria. It is not known how the two met but it is likely that the link was the ship Marco Polo that arrived in Melbourne from England on September 1852, and which carried both Henry’s future mother-in-law, Annie Livingstone, and Clara (Harrod) Stewart who had been a resident at Langawirra station. Henry and Elizabeth’s marriage certificate shows that his usual residence was Wilcannia, NSW where he was an overseer while Elizabeth lived at Lake Leaghur in northern Victoria where she worked as a domestic servant. Elizabeth was apparently pregnant when they married as their first child, Elizabeth Caroline Marion Thomasina, known as Carrie, was born less than seven months later on 31 August 1883 in Hawthorne, Victoria. They were both living at Smith Street, Fitzroy when they married. Two years later a second daughter, Emily Alice Isabella Livingstone who the family called ‘Sister’, was born before the family moved to country New South Wales. Henry took up a position in the Cobar area as caretaker at the 64 Mile Tank, South Road. This position was most likely gained through another former resident of the Darling Back Blocks, James Boultbee. Boultbee had resided at Gnalta [station], not far from Langawirra, in the 1877-78 period, and in 1886 he had joined the Department of Mines and Agriculture as Superintendent of Public Watering Places. Henry later named one of his sons Boultbee. Their next child, Alfred Edward Henry Harrison was born at the 64 Mile Tank on 1 November 1886 followed by George Albert Ernest Sidney on 7 May 1888. During the 1891 census Cobar Henry was in Winbar at the Mulya Government Tank, South of Bourke. The next family home was at The Rock, 32 km southwest of Wagga Wagga, where Henry was the caretaker of the new Government tank dug in 1892 near the railway line to supply water for the town. Their fifth child, Arthur William Boultbee Torrance was born at The Rock on 10 September 1892 but unfortunately he died on 2 October the following year. Arthur is buried in a lone grave beside the Old Wagga (Collingullie) Road on the north bank of Burkes Creek. 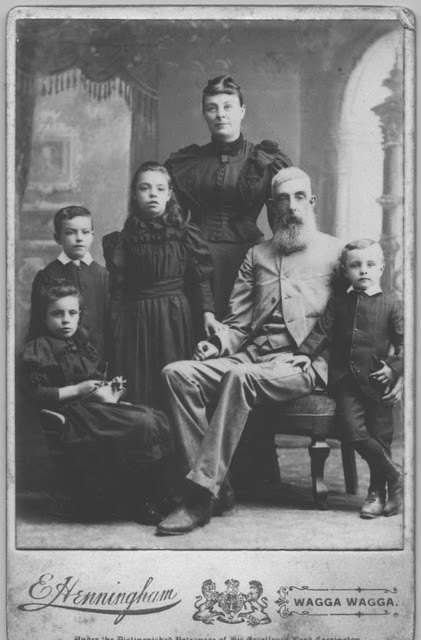 The death of baby Arthur may have been the catalyst for Henry and Elizabeth’s decision to have their other four children baptised together at nearby Wagga Wagga in St John’s Church of England on 14 November 1893. The family photo was taken about that time. Henry and Eliza’s next child, John Robins Warren Low Briscoe was also born at The Rock on 11 January 1895. However when their next son Livingstone Eugene James Alexander was born on 17 July 1896, it was at Pine Street, Sydney, but the reason for being in Sydney at that time is not known. The youngest child of Henry and Elizabeth, Doris Daisy Mary Devereux, was born on 7 July 1898 after the family had moved to Tooloora Bore near Walgett. Henry was again the caretaker of a Government bore. On 2 March 1901 another girl, Ethel Josephine Dorothy Agnes Briscoe (Aggie), was born at Tooloora Bore. Her birth certificate shows her as illegitimate with Elizabeth Briscoe, aged 46 years, as her mother and the local 28 year old grocer, Edward James Rhynehart, as the father. The seventeen year old Carrie was “present at the birth” and known to the family as the real mother. Aggie was brought up as the daughter of Henry and Elizabeth. Before leaving Walgett Carrie married a local lad, Edward Ramsden. It is not known exactly when the family moved to Sydney but a newspaper article on 16 September 1905 identified the address of Mrs. E.G. Ramsden as ‘c/o H.H. Briscoe, Macpherson St., Waverley’. The Sands Directory indicates a H.H. Briscoe in North Sydney in 1907, a Henry H. Briscoe at Newtown in 1908 and a H.H. Briscoe in Moorefields Road Canterbury in 1909. It is very likely that these refer to our Henry. Finally in 1909 Henry Harrison Briscoe was registered as a pensioner in the electoral roll at a 13 acres property where they made their home in Tower Street, Beaconsfield, East Hills. Henry lived with his family at East Hills until his death from cancer of the liver in 1912, aged 75 years. He was buried on 15 April 1912 at St. Saviour’s Church, Row B, Grave No 61. Kangaroo Island was never on the top of our list of places we must visit, but when we were able to accompany good friends on their four day excursion we jumped at the chance and were glad we did. It followed on from our Murray River cruise and, of course, was only a short hop from Adelaide where that trip finished. I had some expectations of what we would find on the island in terms of scenery, wildlife and probably its isolation but were surprised at how it would be so historically significant. Our home for the visit was at Penneshaw with a wonderful view across the 13.5 km Backstairs Passage to where the ferry departed at Cape Jervis near the southern tip of the Fleurieu Peninsula. Day trips in our hired SUV took us to many of the most scenic and interesting spots on the island. We drove as far as Flinders Chase at the south western extremity to see the impressive Admiral’s Arch where we enjoyed the sight of a dozen young seals playing in the sheltered little cove below. On a nearby headland were the Remarkable Rocks which we imagined could have easily been the inspiration for modern sculptors. The wildlife park was surprisingly well presented with a large variety of animals and birds and we were fortunate enough to be there when a delivery of more than a dozen wallabies arrived from a closing Hunter Valley park. After a quick overnight dash to minimise their distress, each animal was released from its hessian sack that, we were told, produced a pouch-like calming environment during their trip, before they bounded free into its new large grassy enclosure. Among the other highlights was a local gin distillery and tasting of honey ice cream produced with the nectar of the Italian Ligurian bees, now only found on our island and of course some souvenir shopping when we visited the island’s largest town of Kingscote. Our accommodation at the small township of Penneshaw provided us with a tranquil setting only disrupted by the arrival of tourist buses on overnight tours. With several restaurants and a very friendly pub, all our simple needs for a quiet few days of unwinding were nicely met. It was helped by the fact that September is still “out of season” and the water temperatures of the Great Australian Bight (and Southern Ocean) did not encourage swimming. We enjoyed strolling around Penneshaw and along the Hog Bay beach to the Frenchman’s Rock and the monument that commemorates the bi-centenary of Nicholas Baudin’s visit. This was the start of an understanding of the historic part the French had played in this part of the world. In our travels we came across a myriad of French place names, starting with the Fleurieu Peninsula on the mainland to points on the island including Cape Bouda, Cap du Couedic, Baudin Beach and Vivonne Bay to name a few. After a relaxing four days on our ferry back to Cape Jervis we met two ladies (one with a place on the island), whom we assumed were academics, and who in our discussions advised us to read “Encountering Terra Australis” (The Australian Voyages of Nicolas Baudin and Matthew Flinders) by Jean Fornasiero, Peter Monteath, John West-Sooby, as a way of learning more about the history of the region and the significance of Kangaroo Island. I took up the challenge almost immediately on my return home and was very pleased to learn more about these two remarkable men and the part they played in our history. The book looks at the available historic documents, ship logs and reports to the respective Governments to give us a picture of their respective expeditions with the trials and tribulations, their discoveries and achievements and how history recorded them, often inappropriately. The two men were different personalities but also had much in common. Their expeditions were very similar being primarily scientific with the French in particular including a large contingent of naturalists. They also had a goal to improve the map of this southern land and learn more about its people. The expeditions took place during Napoleon Bonaparte’s reign, and despite the period of the Peace of Amiens (1801-3), England and France were really still at war so there were definite political and national undertones. Each had to obtain a passport from the opposing country to ensure the safe passage of their expedition. Nicholas Baudin sailed from France in October 1800 in his ship the Geographe and accompanied by the Naturaliste. It was not a happy company because of the contrary behaviour of some of the many scientists, putting a lot of additional strain on Baudin. 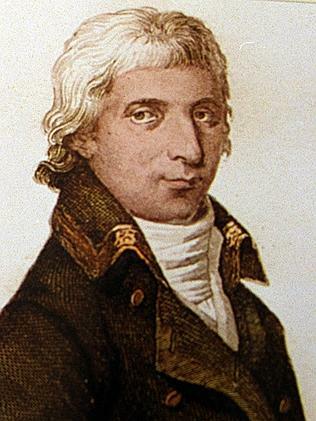 Following episodes that delayed the voyage Baudin reached the French island of Mauritius in March 1801 and eventually sighted Terra Australis on 27 May 1801. 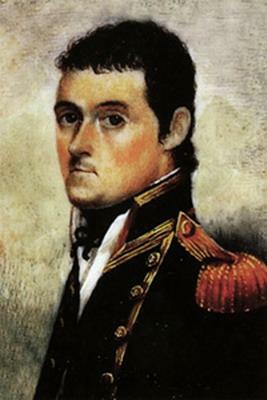 Matthew Flinders left nine months later in July 1801 in the Investigator and had a smoother and more uneventful passage, especially across the Indian Ocean and reached Cape Leeuwin on 7 December 1801. Baudin first proceeded to explore the coastline of Van Diemen’s Land, while Flinders set about mapping of the southern coast of the Australian continent. In April 1802, the two expeditions and their leaders had a very respectful meeting at Encounter Bay near present day Victor Harbour on the Fleurieu Peninsula. Flinders, who reached and named Kangaroo Island on his way eastward, advised Baudin of its safe anchorage and the possibility of replenishing supplies of meat from the numerous kangaroos he saw. Baudin was to become the first to circumnavigate and chart Kangaroo Island, whereas Flinders was later to be the first to circumnavigate the whole of Australia, and verify that New Holland and New South Wales were one continent and not two as was widely believed. Flinders then sailed for Port Jackson arriving in May 1802 and noticed the remarkable advancements that had occurred since his first visit in 1795. After leaving Kangaroo Island Baudin called into Port Jackson in order to reprovision and carry out repairs to his ships. He spent some months there and developed a friendship with Governor King. Finally after visiting King Island, northern Australia and Timor, Baudin set sail for home. He arrived in Mauritius on 12 August 1803 in a poor state of health and within weeks he was dead. The unhappy nature of those on his ships resulting in him not getting the credit the deserved from the successes on the expedition and his place in history has, probably until recently, been undervalued. Flinders’ circumnavigation of the continent was completed in what was by then a “leaky, barely seaworthy vessel.” He finally left Port Jackson in September 1803 and reached Mauritius on his way back to England. Unfortunately the Amiens Peace had expired and because of technicalities over his passport together with his own obstinacy he was detained by the island’s governor for six and a half years. By the time he reached home his discoveries and successes were old news. As indicated in the book, there was a lack of justified recognition of both explorers’ accomplishments by their respective homelands. History however has been somewhat kinder to Flinders in that the emerging nation of Australia and its people have celebrated and honoured his achievements. Their contributions were similar and complementary in terms of the advancement of the world’s knowledge of our great southern land.